The Lebanese love their falafel the small fritter made with ground beans, chickpeas, coriander, garlic and spices; it is both convenience food and a treat. Eateries are everywhere, some provide their clients with tables and chairs but most are tiny establishments and guests spill out onto the pavement. Falafel infatuation is widespread and triggers a gourmet cult. Fans are on a constant look out for the best fritter, each shop offering a unique recipe. 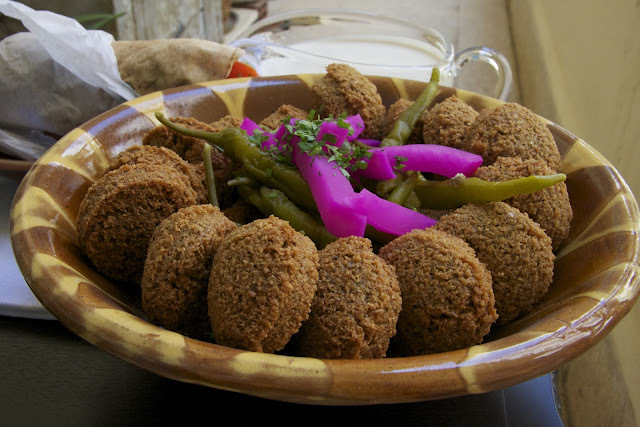 Like hummos, falafel is also at the heart of a cultural identity dispute, but it appears to have originated in Egypt where Christian Copts claim it as their own. Ta’miyah as it is known there, is made with broad beans (fava beans) only; it is at the same time delicate, fluffy and spicy. 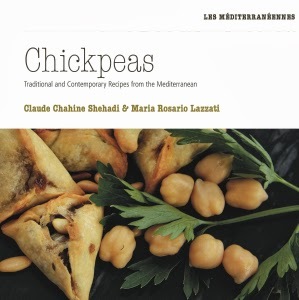 With its mix of broad beans, chickpeas and burghol, the Lebanese falafel on the other hand is thicker and more compact but nevertheless very tasty. 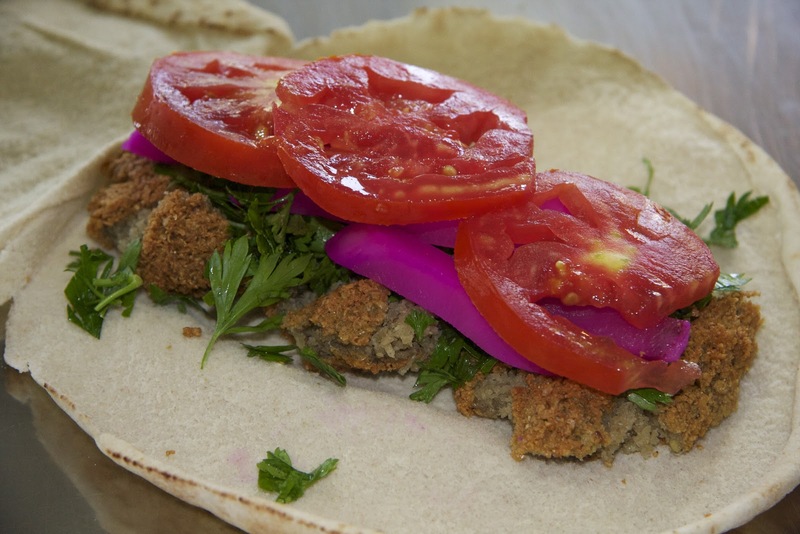 Nutritionally, a falafel sandwich is packed with goodness; the legumes are left to sprout before cooking which releases minerals; the sesame paste (tahini) and lemon juice dressing is brimming with fatty acids and vitamin C; the fresh parsley and tomatoes provide a proportion of your five-a-day. The downside: falafels are deep-fried. For this reason some shops now offer an oven baked version, not as succulent but better for the arteries. I went on my own private quest for the best falafel and found one just around the corner from where we live. It is an uninspiring place with two tables and a counter with stools where people perch themselves to eat and look out of the window onto a parking lot. There is a tilted picture on the wall of a faded and distant mountain landscape. Next to it a small TV plays re-runs of football matches that keeps the assistant chef occupied while frying his latest batch of falafel. When I asked them about their recipe and the possibility of taking a few photographs, they were only too happy to oblige. The chef pointed out that falafels start with good ingredients. He always picks new season legumes. If the chickpeas are 'too old' he said, they would not sprout as easily and were therefore not time efficient. The 'water in which they soak is important' he added, and he made sure that the chickpeas were rinsed several times. He even implied that he used bottled mineral water but I think that filtered water will do. Finally he admitted that his secret ingredient was a touch of ground ginger. I took photographs and looked at the clients; most were men who sat quietly eating and watched me watching them. I did not linger for I could not wait to get home to try out my own version of falafel. 100 g dried broad beans (fool). 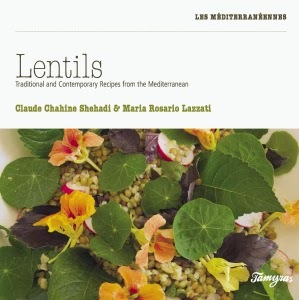 Place dried chickpeas and fava beans in a bowl and cover with cold water. Allow soaking for two to three days or until they just begin to sprout. Change the water once. Drain chickpeas and beans, and place them in a food processor. Crush until you obtain a creamy paste. Add the onions, garlic, herbs and spices and mix well until it blended together. Transfer the mixture to a bowl and add flour. If necessary, at this stage, add a couple of tablespoons water in order to combine all the ingredients together. You want the result to be a thick paste. Form the mixture into small balls, about the size of a ping-pong ball. Flatten slightly. Fry in oil about 5 to 6 cm deep, at 185 °C until golden brown (5 to 7 minutes). Serve hot with tahini sauce and a mixture of chopped vegetables and pickles.